Professor Scheffer was awarded Monash University's 2017 Distinguished Alumni Award for the Faculty of Medicine, Nursing and Health Sciences, and received the award on December 12th 2017, where she also gave the graduation address for the graduating class of Bachelor of Medicine & Bachelor of Surgery students. Professor Scheffer's address begins at 2:30. Professor Scheffer is the lead author on the International League Against Epilepsy's revised Classification of the Epilepsies 2017, the first update to the classification of the epilepsies since 1989. This classification is the culmination of Prof Scheffer's tenure as Chair of the ILAE Commission on Classification. You can read the new classification here, read about it in The Age or in Pursuit, and hear Professor Scheffer interviewed by Dr Norman Swan here or with Red Symons below. Professor Scheffer was one of the key leaders involved in a world-first trial to test the efficacy of cannibidiol for treatment-resistant sufferers of Dravet Syndrome, published in the New England Journal of Medicine. Read more about the trial on Pursuit or the ABC, or read the original paper here. Premier of Victoria, The Hon Daniel Andrews MP, and state Health Minister The Hon Jill Hennessy MP, visited Austin Health on February 3 2016 to launch a clinical trial of medical cannabis in children with severe refractory epilepsy, led by Professor Scheffer. The launch of the double-blind, placebo-controlled trial of synthetic cannabis was covered in The Age, ABC online, The Guardian, Sky News, SBS​ & Channels 7, 9 & 10. The Australian Academy of Health and Medical Sciences was launched in Canberra on March 25 2015, in order to promote health and medical research and its translation to enable a healthier community in Australia and the World. The Academy, of which Professor Scheffer is the Vice-President, seeks to grow the next generation of leaders of Australian medical research, and was launched by Health Minister Sussan Ley MP. Prof Scheffer is pictured with Minister Ley and President Professor Ian Frazer (left) and with the Academy Council (right). 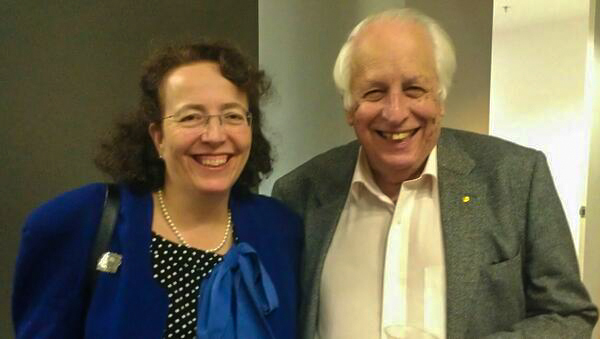 ﻿Professor Scheffer and Professor Samuel Berkovic AC were together awarded the 2014 Prime Minister’s Prize for Science for their long-standing partnership on cracking the genetics of epilepsy. They have received many separate awards and prizes for their work – but this is the first time they have been recognised together. You can read more about this prestigious prize here and here. ​The scientific pair wrote a piece titled "The genetics of epilepsy: bringing hope to families" on The Conversation. A practical, beautiful guide to the ketogenic diet. 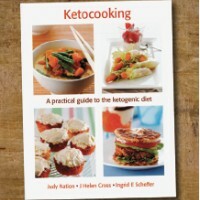 This book, by epileptologists J Helen Cross & Ingrid E Scheffer and dietitian Judy Nation, aims to make the ketogenic diet simpler to understand and use, with helpful hints, useful resources and delicious recipes! More information about the book here and order Ketocooking here. 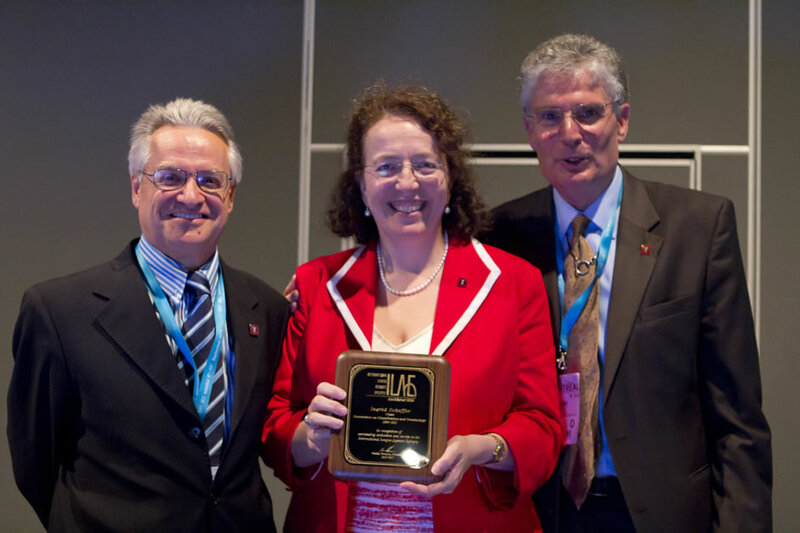 Prof Ingrid Scheffer is named an Ambassador for Epilepsy for 2013, one of the highest awards of the International League Against Epilepsy by President Nico Moshe and Mike Glynn, President of the International Bureau for Epilepsy. Prof Scheffer featured in her role as a paediatric neurologist in the episode "A Place For Us"
Featured in the SBS documentary Jabbed, covered in a front page story in The Age: Just one little jab. 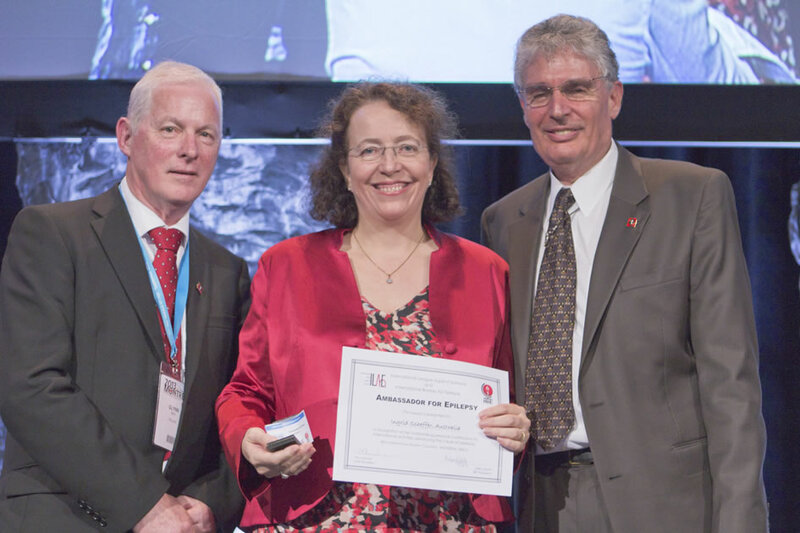 Prof Ingrid Scheffer recognised for her work as Chair of the Commission for Classification and Terminology 2009-2013, with President Nico Moshe and President Elect Emilio Perucca of the International League Against Epilepsy. 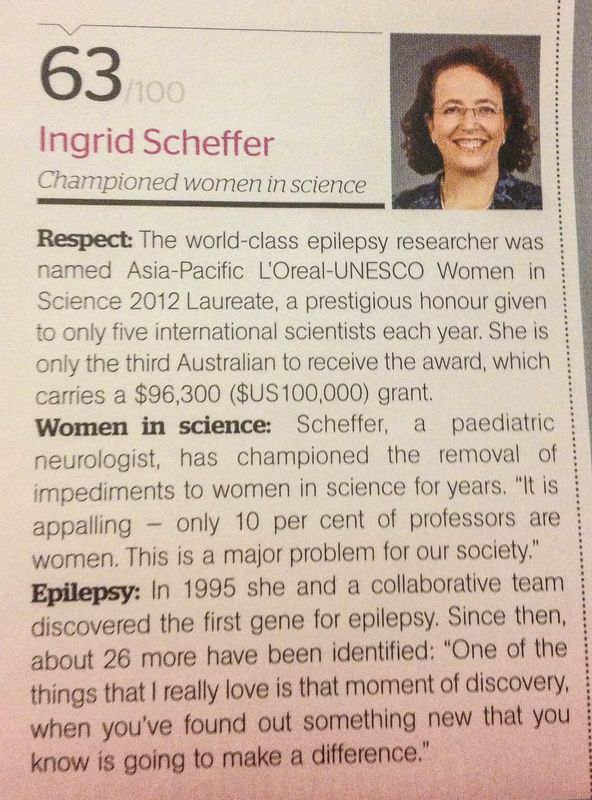 Prof Ingrid Scheffer accepts the L'Oréal-UNESCO award for Women in Science as the Asia-Pacific Laureate in 2012.